Populations in Montana and across North America have experienced rangewide declines, although the causes of these declines are unclear (Bonter and Harvey 2008). Comment174,759 square kilometers based on Natural Heritage Program range maps that appear on the Montana Field Guide. CommentConifer forest and mixed conifer forest habitats relatively stable within +/-25% since European arrival. CommentBBS data has moderate credibility with a significant decline of -10.7% per year or 68% decrease per decade. For the entire Northern Rockies with highest credibility there is a significant decline of -6.9% per year or 51% decline per decade. Declines also noted with Christmas Bird Count data and Project Feeder Watch. CommentModerate Generalist. Generalist in conifer and mixed conifer forests. The Evening Grosbeak is a large, robust finch with a massive, conical bill. This species forms large, irruptive feeding flocks in winter, announcing its arrival with a loud "clee-ip" or "peeer" call. Although gregarious in winter, this species is secretive during the breeding season and little is known about its breeding biology (Gillihan and Byers 2001). Adults observed feeding young from late-May through August. Feeding flocks are irruptive and have been observed September-early May, with the largest flock size occurring during the winter months of December-February (Montana Natural Heritage Program Point Observation Database 2014). A large, stocky finch with a heavy, greenish-yellow bill. Adult male has a brownish-black head with a black crown, and a yellow forehead and eyebrow. The neck and back are brown contrasting with yellow shoulders and rump. Tail and wings are black with large white patches. Throat is brown and underparts are brownish-yellow. Adult female is mostly grayish brown with a thin moustache and yellowish wash on the sides of the neck. Wings and tail are black with white spotting. Throat and underparts are pale grayish-brown. Juvenile resembles adult female (Gillihan and Byers 2001). In Montana, the Evening Grosbeak breeds in coniferous forests of western Montana. In fall and winter, this species is irruptive and is much more widespread, occurring throughout the state. This species has been observed in feeding flocks from September to early May. Spring movements to higher elevation breeding habitat occur in mid- to late-May, with fall movements beginning in early September (Montana Natural Heritage Program Point Observation Database 2014). In Montana, the Evening Grosbeak breeds in mixed coniferous and spruce-fir forests of western Montana. 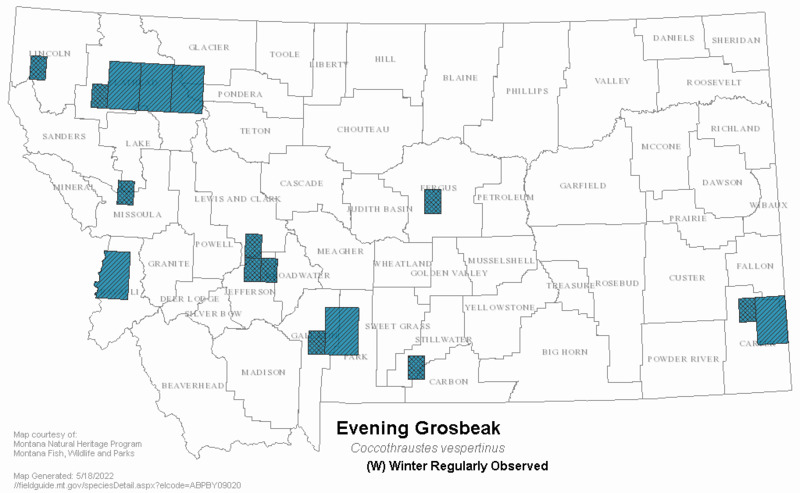 Winter habitat is much more varied, including coniferous forest as well as urban and suburban areas statewide (Gillihan and Byers 2001, Montana Natural Heritage Program Point Observation Database 2014). This species feeds upon invertebrates, especially larvae, and a wide variety of seeds and fruits. Forages in the tops and outer branches of trees and shrubs, and also on the ground for fallen fruits and seeds. This species is a frequent visitor to bird feeders, particularly during fall and winter (Gillihan and Byers 2001). Winter flocks can number in the hundreds during irruptions (Gillihan and Byers 2001). However, this species becomes quite secretive during the breeding season, and relatively little is known of its life history. This species loud, rather unmusical call is unmistakable, and it is given year round. In fact, the Evening Grosbeak's repertoire is made up of a series of calls, trills, and chatters, but this species apparently rarely, if ever, sings. Large winter flocks break up into smaller groups about 3-4 weeks before breeding begins. Pair formation occurs during this time, and birds arrive on breeding grounds as mated pairs. Females begin nest construction immediately after arrival on the breeding grounds. Nests are placed primarily in the upper portion of coniferous trees, often near the trunk. The nest is a spare, saucer-shaped structure composed of small twigs and roots and lined with grasses, lichens, and pine needles. Clutch size averages 3-4 eggs; female incubates. Incubation period ranges from 12-14 days. Female broods nestlings. Both adults feed nestlings, although female feeds more frequently. Nestling period is 13-14 days. Both adults feed fledged young up to several weeks after fledging (Gillihan and Byers 2001). Several studies suggest that the Evening Grosbeak is more abundant in mature forests with high structural diversity (Bonter and Harvey 2008). This species is often killed in collisions with residential windows, likely due to their presence at feeders during the winter (Gillihan and Byers 2001). Loss of mature, structurally diverse coniferous forests can impact breeding habitat for this species. Additionally, the Evening Grosbeak is susceptible to a number of diseases including bacterial conjunctivitis, salmonellosis, and West Nile virus. There is some evidence that Evening Grosbeak populations may fluctuate with spruce budworm cycles, but this link is unclear (Bonter and Harvey 2008). Bonter, D.N. and M.G. Harvey. 2008. 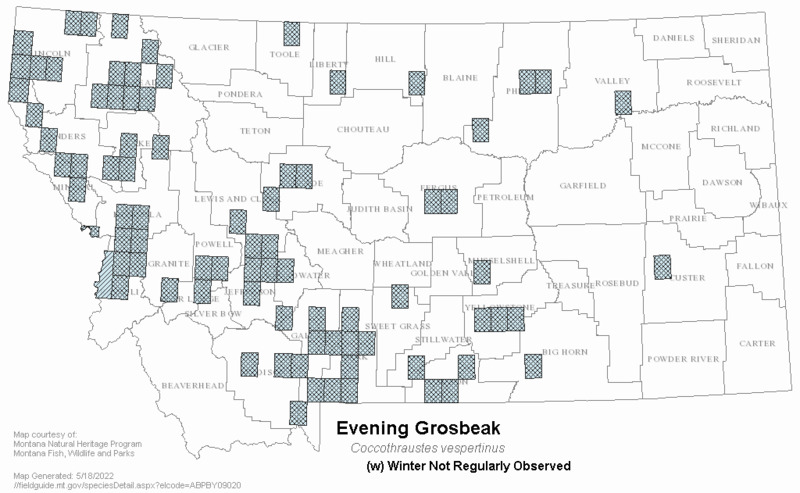 Winter survey data reveal rangewide decline in evening grosbeak populations. The Condor 110(2):376-381. Gillihan, S. W., and B. Byers. 2001. Evening Grosbeak (Coccothraustes vespertinus). In The birds of North America, No. 599 (A. Poole and F. Gill, Eds.). Academy of Natural Sciences of Philadelphia and American Ornithologists’ Union. Bekoff, M., A. C. Scott, and D. A. Conner. 1987. 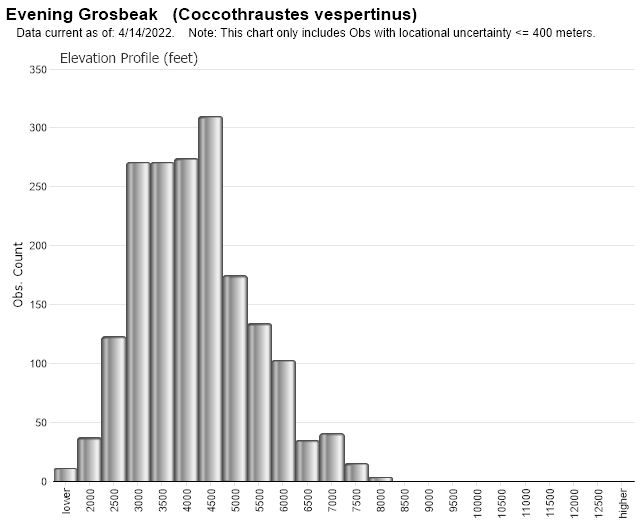 Nonrandom nest-site selection in evening grosbeaks. Condor 89:819-829. Thomas, J. W. (ed). 1979. Wildlife habitats in managed forests: the Blue Mountains of Oregon and Washington. Agriculture Handbook 553, USDA, Forest Service, Wildlife Management Institute, Washington, DC. 512 pp. Web Search Engines for Articles on "Evening Grosbeak"